The winner of the New Zealand Property Investors Federation (NZPIF) Landlord of the Year 2018 is a ‘shining example’ for NZ landlords, says Tenancy Services. The NZPIF Landlord of the Year award honours a member of the New Zealand Property Investors Federation who represents excellence among landlords. Tenancy Services presented the award at the annual NZPIF event, and was represented on the judging panel. In considering the nominees, Tenancy Services looked for a landlord who builds positive relationships with tenants and could demonstrate compliance with Residential Tenancy Act (RTA) requirements, specifically the 2016 changes to insulation and smoke alarms requirements. “It was important that the nominees exhibited an understanding that renting is a business,” says Jennifer Sykes from Tenancy Services. The winner of this year’s award demonstrated how she takes a professional approach to her rental business – seeing herself as a service provider to her tenants and placing importance on being responsive, respectful and courteous to her customers. 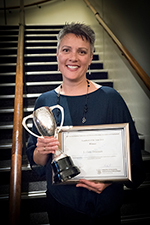 Tenancy Services was pleased to present the 2018 ‘NZPIF Landlord of the Year’ award to Leilani Driessen. “Leilani’s record keeping was of a high standard including clear demonstration of compliance with the RTA and her tenants described her as warm and friendly but also clear with her expectations, which they appreciate as they know exactly what is expected of them,” says Jennifer. A feature that stood out to the judges was how Leilani’s tenants spoke of her caring nature and a willingness to ‘give tenants a chance’ where due to their circumstances, would likely have found themselves facing many barriers when trying to find a home. “I feel very honoured to have been awarded Landlord of the Year 2018 from NZPIF and Tenancy Services and to also receive validation from my tenants that they think I am doing a good job,” says Leilani. “As a landlord, my aim is always to build a positive partnership with tenants. I believe that each has a duty to each other – it’s our property but their home. Leilani is based in the Hawkes Bay where she and her husband own a number of rentals in Hastings. She juggles raising her three young children alongside managing their properties and is a member of the Hawkes Bay Property Investors Association.